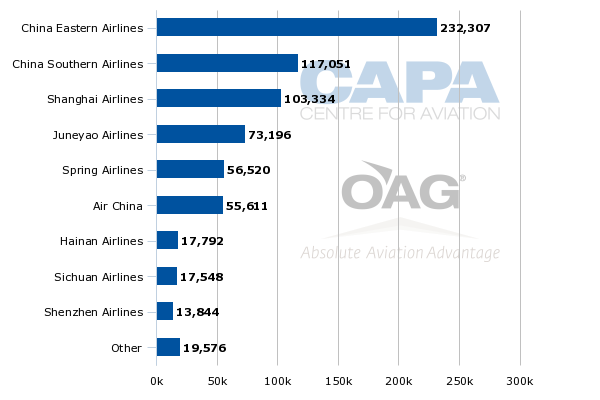 China Eastern Airlines is not Beijing's favourite child. China’s second-largest airline and the world’s eighth largest is still coming out of its merger with Shanghai Airlines some five years after being announced. This is partially due to competing interests from centrally owned China Eastern and municipally owned Shanghai Airlines, which has left neither side completely fulfilled. The clunky merger has fuelled anecdotal experiences of inefficiency. Passengers are able to take their business elsewhere, with Shanghai increasingly the most fragmented of major Chinese hubs, to China Eastern’s disadvantage. Nonetheless Shanghai is a hub with tremendous international growth opportunities, and China Eastern sits astride it. But the airline has failed to capitalise on this with slow long-haul growth. This owes much to 787 delays and then the carrier’s conversion to 777s. Now the first 777 is due by the end of 2014. With 20 on order – a huge number for a Chinese airline – China Eastern is seeking long-haul growth, mainly in North America, and looking to make a statement change. This will be helped with a new brand, a first to occur in China, and spearhead Shanghai’s growing position with a new Disneyland park and growing free-trade zone. China Eastern will be seeking to prove it is not too little too late. If its bet is correct, its stature will rise – to the detriment of others. The 2009 merger between China Eastern and Shanghai Airlines has been lumpy, with under-performing China Eastern taking over small but better (in performance and customer satisfaction) Shanghai Airlines. The state-orchestrated merger created competing interests as Shanghai's government wanted to retain a visible profile for Shanghai Airlines, for which it had great ambitions. This however would have meant two separate AOCs, limiting synergies and creating tension furthered by China Eastern not investing in Shanghai Airlines’ fleet or by allocating it secondary routes. This has started to change as Shanghai Airlines undergoes a fleet renewal. The merger critically gave China Eastern a larger market share in Shanghai, but in Jul-2014 China Eastern and Shanghai Airlines have a 50% share at the mainly domestic Shanghai Hongqiao and 32% in Shanghai Pudong International Airport - compared with Air China’s 40% share in Beijing and China Southern’s 50% share in Guangzhou. While China Eastern has a more competitive local hub than Air China or China Southern, its legacy performance resulted in government frustration, which in turn resulted in a willingness to expand access to the Shanghai market. The objective was to increase competitiveness and nudge China Eastern, but there were also undertones of increasing competition as a punishment for lacklustre performance. Greater competition also ensured that if China Eastern did not survive (which in the past was not a farfetched thought), there would still be other airlines able to grow. China Eastern has received criticism for its limited long-haul network, especially in North America. It was only in Jun-2014 China Eastern inaugurated its fifth North American destination (Toronto); in comparison Air China serves seven points in North America. China Southern in Aug-2014 will launch its third point (New York JFK), a smaller number than China Eastern but perhaps excusable given China Southern’s geographically disadvantaged position further south in Guangzhou. In Europe, China Eastern serves five points while Air China serves 16 points and China Southern 10 points. Whereas China Eastern is seen as not having remotely exploited the potential of its Shanghai hub, China Southern is credited for punching above its weight and turning its Guangzhou base into a hub for Australia-Pacific traffic. Profitability of this is unclear – China Southern vaguely reports the network is profitable – but regardless, there are state-led strategic imperatives that necessitate long-haul service in the absence of profits and capacity has fluctuated. Long-haul services are generally loss making for Chinese airlines, and this is the case for China Eastern. However, losses are being reduced (especially in North America) and China Eastern expects its long-haul network can only be profitable after the 777 replaces its A340s-600s. (China Eastern is trading in its A340s to Boeing.) The only other anecdotal long-haul profit statement is from Hainan Airlines, which in Jun-2014 said its established Seattle destination is profitable while newer routes are building towards profits. China Eastern had envisioned earlier long-haul growth with the 24 787s it ordered. The 787s were originally due to begin arriving in 2008 but were repeatedly postponed. The delay, combined with performance changes that no longer allowed the type optimally to reach the eastern part of the US resulted in China Eastern in Oct-2011 terminating its 787 order and instead order 45 737s. In Apr-2012 China Eastern ordered 20 777-300ERs, with the delivery in 2014 representing a nearly six-year delay to China Eastern’s long-haul growth plans. In 2008 China Eastern would have been a bit behind Air China while ahead of China Southern, but in 2014 China Eastern is now clearly behind. Thankfully for China Eastern, it has prevented Air China from flying long-haul routes from Shanghai to North America; although Air China has been able to launch flights from Shanghai to Europe and Australia despite Shanghai not being its main hub. The 20 777s is less than the 24 787s China Eastern originally ordered. However, depending on the configuration China Eastern intended for its 787s, the 20 777s could represent upwards of 20% more seats than smaller but more numerous 787s. The comparison between 20 777s and 24 787s is also distorted by the rapid growth of A330s in China Eastern’s fleet. In 2008, China Eastern had 20 A330s with none on order, and ended 2013 with 36 and a further 15 on order. Some 787 routes are or will be served by the A330 instead. China Eastern’s 20 777s elevate it to a fighting position: Air China operates 19 777-300ERs (with one on order, and Air China will also have 747-8s and 787-9s) while Cathay has 41 (with 12 on order) and EVA Air 18 (with six on order), for example. China Eastern will take time to reach critical mass with its 777 fleet, although deliveries are skewed for early years with 14 aircraft to be delivered in about a two-year time frame. There will probably be further orders for delivery in the latter part of the decade as China Eastern is a likely “bridge” customer to receive late-build 777s ahead of Boeing starting 777X production. The 777X Asian launch customer, Cathay Pacific, will receive its first in 2021, meaning it will take its first next-generation aircraft shortly after China Eastern builds a sizeable long-haul fleet. China Eastern is using the 777 delivery to introduce a revised brand, the first rebranding in recent history for a Chinese carrier. This is testament to how critical China Eastern sees the 777 as projecting a new image to both the government and consumers. The importance is so significant that China Eastern is lobbying the CAAC to let China Eastern commence international services within a month of receiving the aircraft type rather than wait the regular multiple months of domestic induction flying. China Eastern’s initial 777s will be used to replace its existing five A340-600s by the end of 2014. The A340-600s are used on services from Shanghai Pudong to Los Angeles, New York and Toronto. They previously served Paris CDG but have been replaced by A330-200s. There will be some growth in China Eastern’s initial 777 delivery period, but after 2014 deliveries should result in pure growth. China Eastern expects the 777s will mostly be used on North American routes. 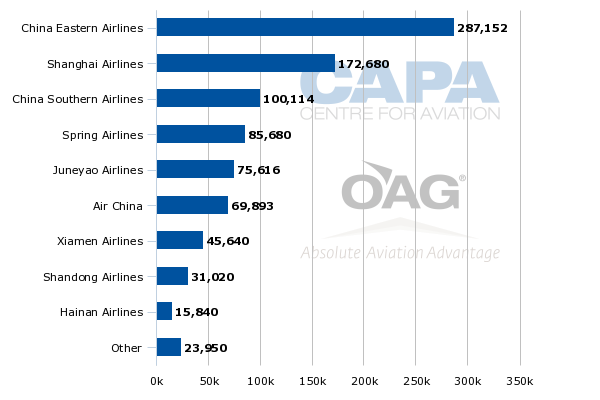 In comparison, Air China uses its 777s on some European routes while Cathay uses its 777s to Europe and South Africa while EVA Air also uses its 777s outside of North America; in short, the prospect of China Eastern having nearly 20 777s (likely more with expected future orders) serving the North American market is a significant position – as well as a threat. The North American market in 2014 is slightly over-capacity but overall long-term prospects are strong, especially as the United States continues to make it easier for Chinese nationals to obtain visas. China Eastern’s prospects for market expansion are strong as it should be able to win back traffic that has been lost to other hubs, and will differentiate itself with a strong premium product. The China-Canada bilateral is limited and constrained while the China-US bilateral has room for Chinese carriers. Canada is conservative with bilateral expansion, be it with mainland China, Taiwan or Gulf nations, while the US is far more receptive, especially now that US carriers have maximised their allocations on first tier cities. China Eastern’s 777-300ER is due to seat 318 passengers in a three class configuration: four in first, 56 in business and 258 in economy, according to regulatory filings. This includes direct aisle access for every seat in business class, a first for a Chinese airline. China Eastern is using the Cirrus business class seat, similar to Cathay Pacific and EVA Air. This is a strong upward positioning in business class that should greatly benefit China Eastern. It has, for example, made significant market share gains in the premium Hong Kong-Shanghai market thanks to its premium product. China Eastern is hoping to ride on – and also contribute to – Shanghai’s increasing profile as a tourism destination, one set to grow with the 2015 opening of a Disney Resort in Shanghai, the first in mainland China. Shanghai is a common tourist destination for foreigners who come to see the city and its rapid growth encapsulated in the Bund skyline but also historical colonial heritage – rare in China (and indeed, Asia). But for domestic tourism, which comprises the majority of arrivals, Shanghai garners considerably less interest than Beijing, the capital with official sights but also a representation of the “old” China. Domestic visitors to Shanghai are common during the week for business reasons, but not at weekends. Shanghai’s hope is that Shanghai Disney will keep weekday tourists in Shanghai while also bringing in new ones on weekends. Shanghai Disney will complement existing Disney parks in Tokyo and Hong Kong, although the latter has under-performed with visitor statistics. The tie to aviation and China Eastern specifically is furthered with Shanghai Disney’s location in the Pudong area, in proximity to Shanghai Pudong Airport, southeast of the city centre. Most passengers find Shanghai Hongqiao far more convenient being placed just outside the western part of the city. Hongqiao Airport is also connected to an extensive ground transportation hub comprising buses and high-speed trains, allowing for easy connections beyond Shanghai. Whereas Hongqiao is mainly a domestic airport, Pudong has a larger international focusd. But the full utilisation of Hongqiao combined with the need for domestic feeder flights for international services means there are substantial domestic services at Pudong. Pudong yields however are typically lower than out of Hongqiao, reflecting the incentive airlines need to offer for passengers to make the trek to Pudong. China Eastern hopes growing interest in Pudong from Disney and the free-trade zone will gradually boost Pudong yields. China Eastern’s 777 delivery may seem nothing out of the ordinary, after all Air China and China Southern already operate the 777. But in terms of strategic value, this is arguably the most important aircraft delivery in China in recent history, surpassing China Southern’s A380 (which is under-utilised) or the 787 deliveries that for China Southern have allowed replacement of A330s, while for Hainan have permitted some route openings. The 777 for China Eastern marks the start of long-haul growth to primary cities from its under-served Shanghai hub. There is also the connotation of the 777 delivery signalling China Eastern, after a choppy period, has a solid future – a prospect that has not always been certain. With the CAAC later in 2014 likely to undergo a leadership change that could see China Eastern officials replace Air China ones, China Eastern in the long term could after all become the parental favourite - and rise to its potential.